It’s seems that the 5.9″ phone from Motorola codenamed ‘Shamu’, which according to rumour is supposedly the next Nexus phone is getting leaky. 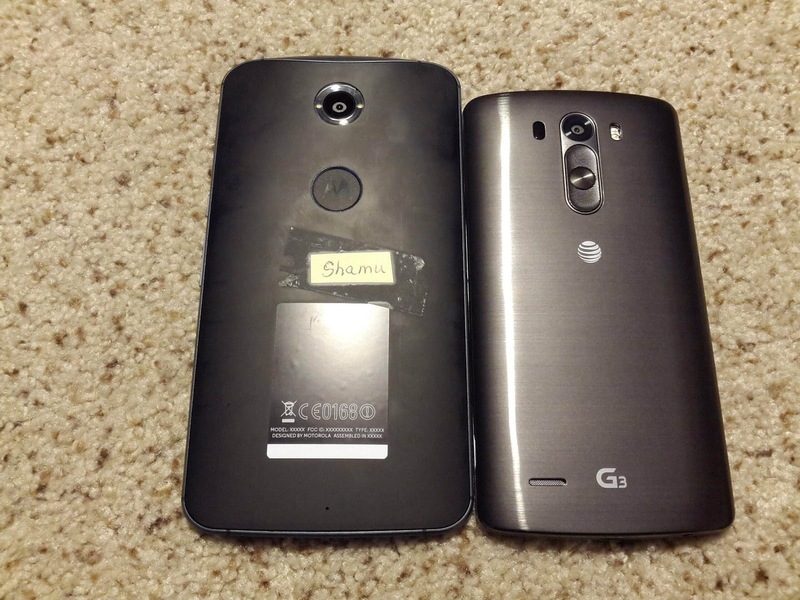 As you can see it’s a fairly large device, especially compared to the G3, which is a fairly wide device, add to that an extra half inch or so and it’s going to be a prize catch for fans of the phablet. The phone shows off similar features to the 2nd gen Moto X, with the rear dimple complete with Motorola logo and a flash ring around the camera. There’s no sign of the buttons on the side of the phone to tell if 9to5Google’s tip that the phone will have slightly different button configuration to the new Moto X. While it has Motorola branding, it doesn’t have Nexus branding, although last years leak of FCC filings for the Nexus 5 also carried no Nexus branding, so it’s most likely that it’s an early build. Of course the only link to Nexus is the over-size body and the hand-written ‘Shamu’ note stuck to it. The choice of whether to go large or go home is now on the table for Nexus phones. Of course the hope that Google could deliver a Phablet sized Nexus alongside a more traditional phone sized Nexus is there, with a 5.2″ Nexus rumour still circulating. We’ll have to wait and see.